We know that Samsung makes a fine LCD, whether it be a computer display or an HDTV, and this new P2370L looks no different: LED backlight, 16.5mm-thin, 1080p resolution, all for $400. The only thing missing is HDMI, but in this package, that's everything you can get in Apple's notoriously overpriced displays and more for less than half the 24-inch LED Cinema's $900 price tag, albeit without the built-in webcam or speakers. Release has no size, but we are assuming 23-inches here from the model designation. LAS VEGAS—(BUSINESS WIRE)—Samsung Electronics America Inc., a subsidiary of Samsung Electronics Corporation, the number one monitor brand in the world, announced today the addition of a super-thin LED monitor to its "Touch of Color" (ToC™) family – the P2370L. This new high-end, model has a Light Emitting Diode Back Light Unit (LED BLU), instead of the cold cathode fluorescent lamps (CCFL) found in standard LCD displays, and reproduces more vibrant color and higher contrast ratios than other monitors. With its sophistication-meets-high technology form factor, the P2370L display will ship in late first quarter with an MSRP of $399. The monitor's ToC design technology has an ultra-thin wrapper of just 16.5mm (0.65-inches) and is a great fit for any home or office environment, helping to maximize desktop real estate and minimize its physical and carbon footprint reduced. Key eco-friendly benefits of the P2370L model include LED fluorescent lamps that do not contain harmful elements such as mercury or lead, consumption of 30% less energy and a longer life than a standard CCFL backlit unit. In addition, the ToC manufacturing process eliminates harmful paints and sprays to enhance the recyclability of the entire monitor. "As one would expect from Samsung, the P2370L represents the pinnacle of premium display craftsmanship as a high-end monitor that is sophisticated in not only appearance, but in the quality and performance it offers and in how it impacts the environment," said R.A Atanus, Vice President of Product Marketing at Samsung Electronics' Information Technology Division. "This monitor is truly a leadership product that will further solidify Samsung's position as the foremost authority in the design, engineering and performance of displays worldwide." The P2370L uses white LEDs and has a ultra-high contrast ratio of 2M:1. The monitor also has an ultra fast 2ms (GTG) video response time and offers a 1080p full-HD experience. The P2370L display's transparent, crystal-like, bezel frame has blue gradation that gives it a glass-like appearance, and helps to reduce the reflection of light to decrease glare. The model also has a unique glass stand neck that gives the illusion that the monitor is floating. It is also equipped with Samsung's dual-injection technology that lends it a smooth, finished appearance without any screws or joints. The P2370L is designed so that there are no obtrusive buttons on the front or sides on the panel. Instead, each display features Samsung's unique Startlight Touch Controls which integrate the On Screen Display (OSD) buttons into the bezel for a seamless look and feel. 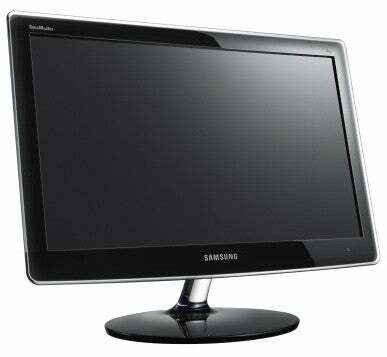 All monitors are available through Samsung resellers and distribution channels, which can be located by calling 1-800-SAMSUNG or by visiting www.samsung.com. Samsung Power Partners receive special promotions, lead referrals, training and technical support, as well as collateral and marketing materials. To find out more about becoming a Samsung Power Partner, visit www.samsungpartner.com.